Mulch Needed | Enrich, define, beautify. It's your life! Enrich, define, beautify. It's your life! This was my spring. A lot of flowers had a chance to bloom–my career, my sense of adventure…my love for my family. I moved a thousand miles away, and nearer in that last respect. It takes a plane to visit my parents now, but my sister is practically my neighbor! I thought I knew what city living was like, but Boston is a whole different speed for me. These days I take a commuter train in to work and nearly every morning it’s quieter than a library–50 people shuffling their shoulders in communal private time. Most people read on various screens but it’s given me time to make my quilt bloom as well. I keep ending up with unfinished stacks. Stacks of laundry, unread books, unfinished work, and the mental press of things I (should already have done) need to do. There’s also a pile of fabric scraps and a cutting board that’s taken up semi-permanent residence on my living room floor. Did I mention I’ve taken up another crafting hobby? On the the one hand it’s reassuring to have lots of projects going. If my wrist acts up from crocheting, I can switch to sewing, or take a break from cutting dozens of tiny squares out for English paper piecing. On the other, I feel almost…guilty? I don’t have expertise in any of the crafts I’ve taken up. I’ve got a beginner to intermediate skill level in each, with a broad knowledge of how they interconnect. Is it more rewarding to do a deep dive into one craft to get a feel for it? I’m debating taking a couple classes in garment construction so I can draft my own patterns, and I’m always on the hunt for folks who know how to use their antique Singer sewing machines and want to share. The last thing I want to do is make it into work though, and start warbling about ‘subject matter expert’ this and ‘synergies’ that. Nah, I just…want to do a little more, better. And if making a quilt top out of 1.5 inch diameter hexagons doesn’t mean having a little more patience for the better part of a year I don’t know what does! It’s only Monday and I’ve already caught myself driving to the grocery store three times. I was able to roll on by without stopping, but it’s funny how you get in the habit of thinking that the things you want are necessities, or ‘staples’ that oh my god aren’t in the house and we’re. Gonna. Starve. Personally I want fresh fruit and veggies in the house all the time…but it’s a house of one, and often my shopping leads to excess and waste. It’s all too easy to let a bag of apples spoil. The bag is more cost effective than buying loose apples, but if I let some go to waste is it really any better? I made hummus out of…. I put it on corn tortillas (re-hydrated by covering them with a damp paper towel and microwaving for 20 seconds) with fresh spinach…after removing the paper towel. I fried up ground turkey that’s been hanging out in the freezer with a packet of taco seasoning, and allowed a rind of brie to melt all over it to top off the tacos. After looking this list of ingredients, I’m questioning the flavor combinations, but hey! It’s filling, and pretty darn tasty for twenty minutes of effort. It’s also the first time I’ve had to cook in quite a while. I went to visit my folks over the holidays, and brought back so much food that its lasted about a week–and that’s not even counting the dry goods my Granny sent home with me! I’ve finally reached the point where I think I need to start rotating the canned goods in my cupboards so I use the oldest things first. Are there other standard kitchen cupboard related activities I should know about? I made it a priority to learn how to play again. My younger sibling definitely benefits from my world building skills when we pretend the apocalypse occurred and zombies are after us! I didn’t go on a single date. Instead I focused on important things like watching Hannibal and learning I could eat an entire pizza by myself. Take that Adam Richman! I also traveled to Richmond, VA by myself and had a grand time. Sometimes letting life just happen brings its own rewards! Still, I feel like like making a list of things you want to get done, and breaking it down into manageable steps is one of the best things you can do for yourself. Bucket lists, resolutions, yearly goals…I honestly don’t care if your completion rate is 100% or zero. If I’m worrying, overwhelmed, bored…lists bring the satisfaction turning chaos into a semblance of order. Plus I like checking things off. AND they can be a physical reminder of success on days when I’m feeling down. Bigger lists help me bring into focus how I want to be as a person too. I get serious. I make spreadsheets. Without them I would merrily turn into a complete hermit–actively planning how to reach out to people and setting goals for trying new activities is the best way I’ve found to combat feeling isolated. I also found this cool blog called The Chorizo Chronicles, which doesn’t have a lot to do with chorizo, but does tell us about a dude named Daniel, and what he does as a language trainer while living in Madrid. Have fun! That was a bad pun ya’ll. I fixed my house slippers. Have you ever noticed the way slippers are sold in whole sizes, or as a small/medium/large? Why is that? My feet are ‘Large’ but my large is a US 10.5, and in the slipper world Large equals a size 10. Cue sad face. That’s all to say that I have one magical pair of slippers that fit and are comfy, and I refuse to let them go anytime soon. 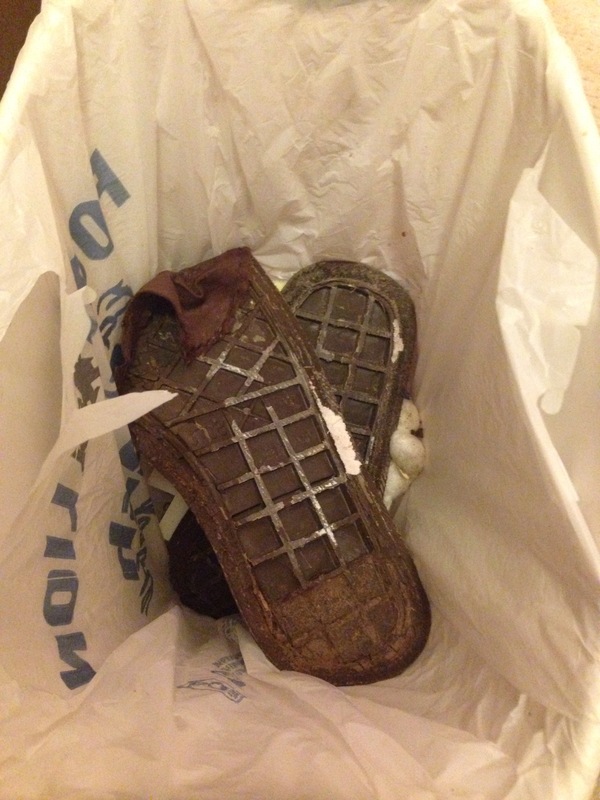 The rubber soles have been cracking and shedding all over the house, so I ripped those suckers off. 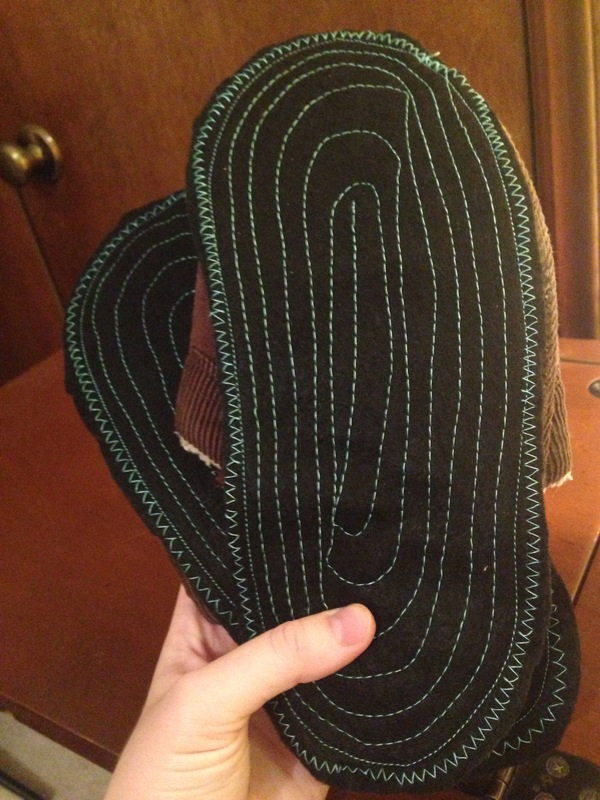 When I went to trace the outline of shoe onto the new sole, I realized I don’t actually have tailor’s chalk, which would be a crying shame except.. I found a way to make do. 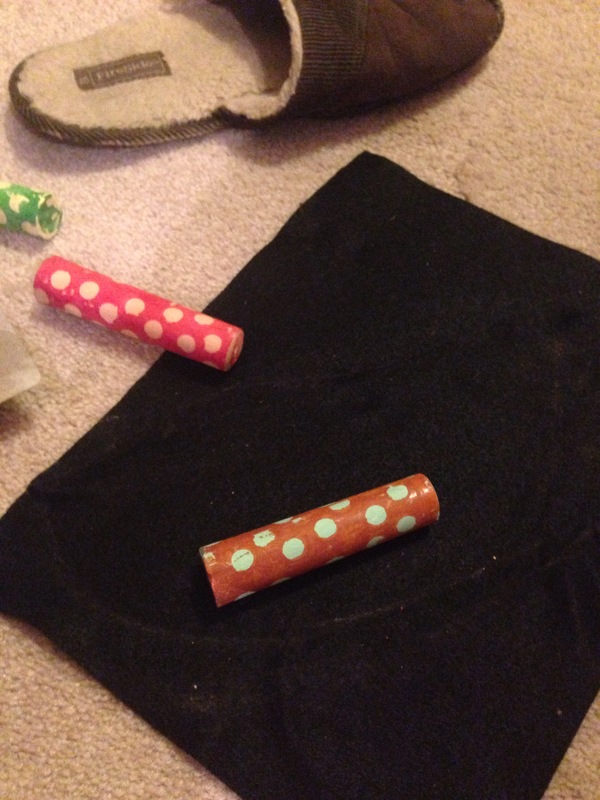 Next go round I’ll try a sturdier material, but sewing two layers of felt together did the trick for now. 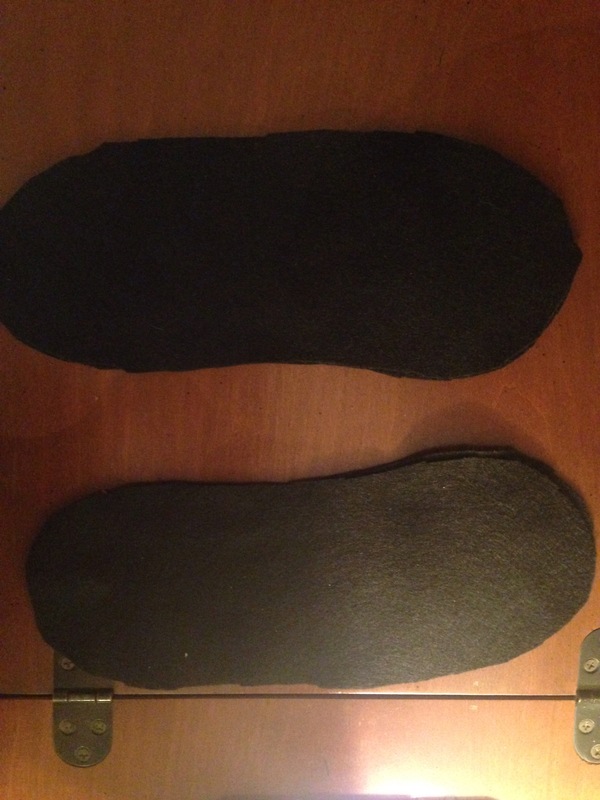 I doodled around on the sewing machine to create traction on the soles, and then super glued it all together. Pro-tip: keep an eye on the proximity between glue and the carpet. Nothing happened! Don’t panic! Just an FYI. Ahem.